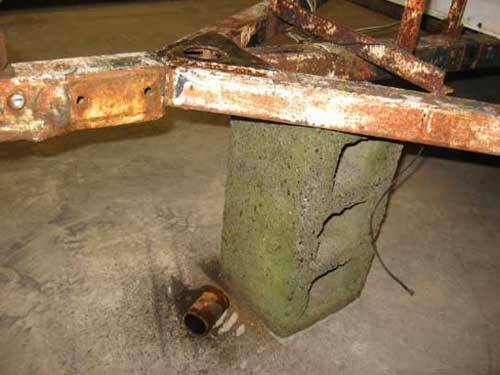 My 1969 13' Gaucho came with just the outer tube of the jack (and a mossy cement block), so replacing the jack was my first project once I got the Scotty inside the garage. 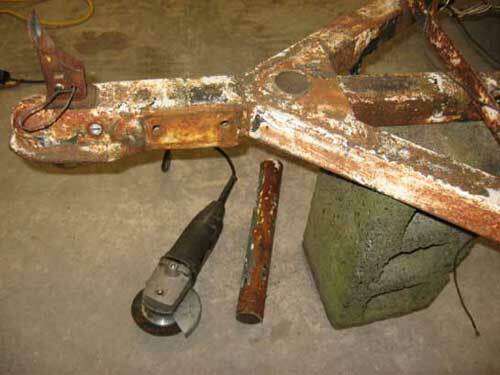 Scotty campers use what is called "Round Tube A-Frame Jack". These jacks are available as either side-wind or top-wind, with capacities of 1,000, 2,000, 3,000 or 5,000 pounds. 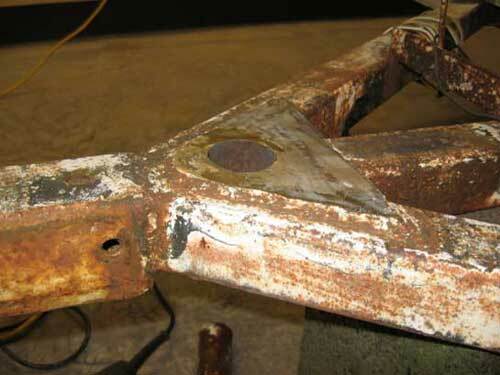 The original jack was most likely welded in place, but you can either bolt or weld the replacement jack into place. I chose bolt and that is what is documented below. 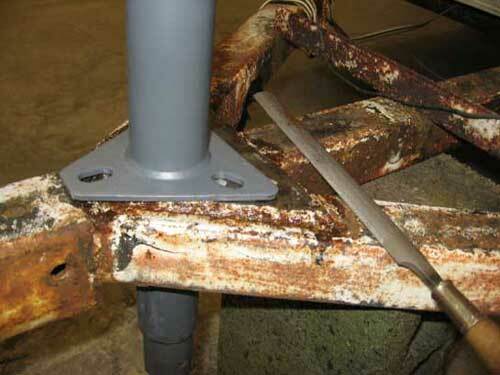 This procedure would lend itself to welding as well, simply replace the bolt steps with "weld the new jack in place". Measure the outside diameter of the outer tube of your existing jack. This will either be 2.25" or 1.88". If it is the smaller size, you need the 1,000 pound capacity jack (all three of the heavier sizes use the 2.25" tube size). The smaller size is not found just anywhere. I located mine at Northern Tool and Equipment, northerntool.com or 1-800-556-7885. They carry the full line of Fulton jacks (Bulldog brand, "tough and trusted"). If you need one of the other sizes, you can determine which one by comparing your jack's retracted/extended measurements with the descriptions on their Web site. To do the job as I did, you will need a 4 1/2" angle gringer with both a cutting wheel (4 1/2" x .040 x 7/8) and a grinding wheel (4 1/2" x 1/4 x 7/8). You should also use hearing protection and safetly glasses. Using the cutting wheel, cut the upper part of the tube off as close as you can to the triangular mounting plate it is welded to. 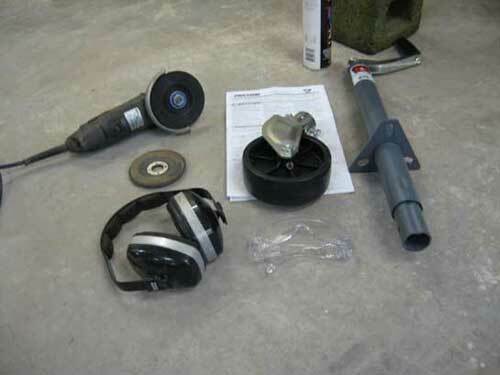 This takes about a minute and then you change the grinder to the grinding wheel. Now grind the tube and its welds down even with the triangular plate (will take a while), until you can see the outline where the tube's outer side meets the plate all the way around. I also ground the surface of the plate to remove the old paint and some welds that protruded above the plate's edges. 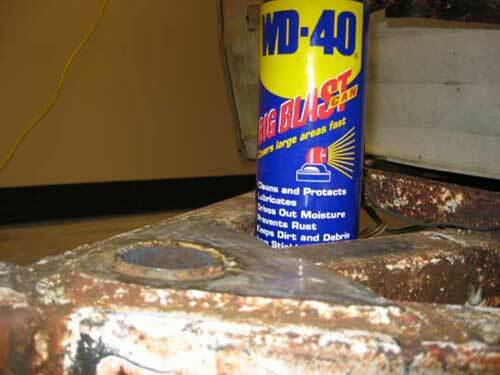 After applying WD40 at the seam between the tube and plate, hammer around the tube from below. 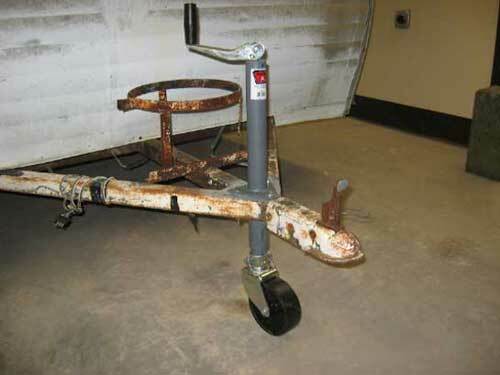 The tube should break loose and move upward - drive it up about an eighth of an inch. 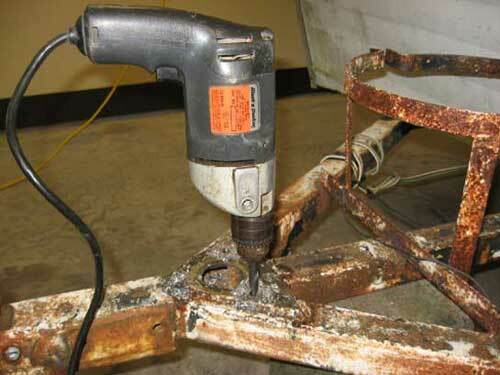 If it doesn't break loose, you need to grind some more, or hammer harder as there must still be some weld holding it. Now use the hammer and the upper piece of tube you cut off earlier to drive the rest of the tube down out of the hole in the plate. After its out, you need to file around the lip of the hole in the plate with a half-round file, until you can easily fit the new jack's tube into it. 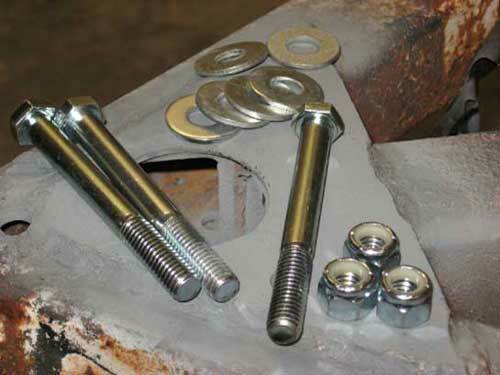 Put the new jack in place, with the plates pointed corners to the rear, and use a metal punch and hammer to mark exactly where you want the bolt holes to be, then remove the jack. Using a 3/16" bit, drill pilot holes through the plate. Then switch to a 3/8" bit and drill through the plate, making sure you are drilling straight on down through the bottom plate. 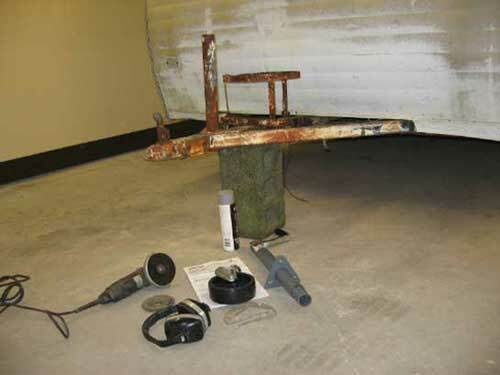 After the holes are drilled, prime the old plate with a rust-resistant primer. Read the instructions and use the correct items - I needed three 3/8 x 3 1/2" grade five cap screw bolts, six washers, and I chose to use lock nuts.